The Blackwatch Plaid Ruffle Tunic, by Devon Baer, is a Tuckernuck favorite! Featuring a tunic fit and a ruffle collar, this piece will become a closet staple. We will pair with jeans and wear it to a family reunion. For a work look, we will dress it up with heels and black pants. 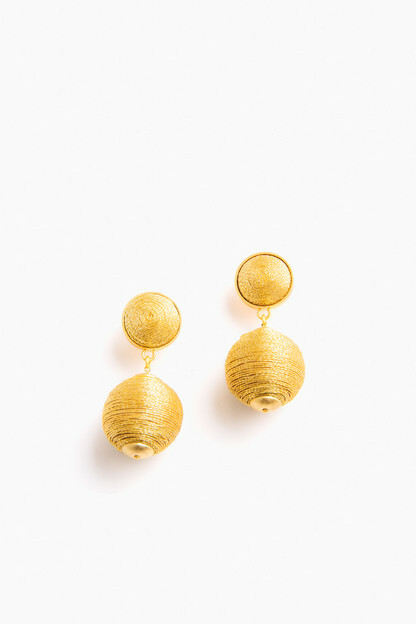 Instantly, it will add an elegant feel to any outfit! Absolutely love this gorgeous top! I had been eyeing it for awhile and I’m so glad I snagged it before it sold out. I love black watch plaid and that combined with the classic, tailored style and beautiful fabric is a home run. You instantly look and feel polished and chic when wearing this! I’m 5’5 and 125lbs (with broad shoulders) and purchased the small. I’m happy with the fit. As has become the norm for my purchases from Tuckernuck, this ruffled tunic proves to be yet another classic piece which will be enjoyed for years to come. Great shape but not very structured. As the title says, the overall shape of this top is darling. I love the Ruffle around the neck. However, the ruffled neck is not as structured as I think it should be. It has a rather floppy appearance while on and isn't stiff enough to maintain its shape while wearing. On sale, it's a keeper. I certainly wouldn't pay full price for this. 4/5 Stars. A definite contender for fall wardrobes. Love that it can be dressed up or down. The stand up ruffle collar makes whatever you are doing seem fun! This is more beautiful in person then depicted -and that is saying a lot! 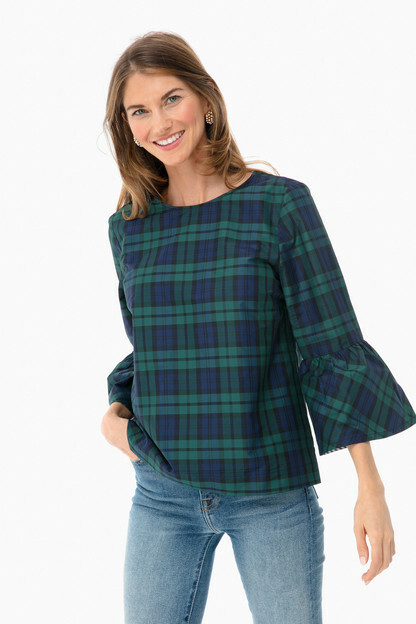 It will be a perfect holiday blouse but because the plaid is subtle I plan on wearing it throughout the winter-and the fit is exactly as described. 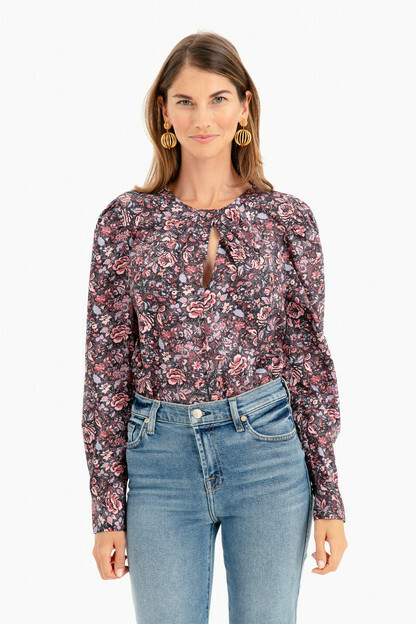 Love this top, especially the ruffle collar. Fits well. Note that the fabric is nice, but lightweight. Gorgeous top!! Thinner than I was expecting, but so pretty and flattering. My daughter loves her shirt! She loves all the items that we buy at Tuckernuck. My daughter loves all products that we buy at Tuckernuck. She was waiting for this shirt to come on sale and I surprised her and brought for her! I brought Kim the Navy Barber coat for Christmas this year. She totally loves it and where is it all the time. Your website is very classy and your packaging is outstanding. We love buying from Tuckernuck and can’t wait to see what your spring line looks like. Thank you for making Kim’s wardrobe outstanding. My best to all of you at Tuckernuck. I recently got the black-watch plaid tunic and wore it to a party and everyone loved it! It was so easy to wear, comfortable but lovely at the same time. I loved it so much I got the Stewart plaid too! This is a good investment, perfect for casual and dressy. It fits true to size and description. I have worn with jeans and a dressy skirt, got complimented at both parties. Neck line is very flattering and fabric is comfortable. Buy it now you won't be sorry. This blouse has gotten me more compliments than any clothing item I’ve ever owned! Beautiful.. Simple.. Classic.. Tuckernuck excels at the current and staying traditional and classic. This piece is amazing in its versatility. Dress it up and then pair it casually with a pair of jeans. I love having things I can wear during the holidays and this tunic is a new favorite! It's classic. Well made. I can dress it up or down! I bought this shirt in both plaids after admiring it for years and my only regret is not doing it sooner. This is THE perfect shirt for a party, date night or dinner out with the girls. Every single time I wear it, I receive compliments. I love the look and feel of this top. Works well tucked or untucked. The ruffle is a nice feature without being too much. Well worth the money! I absolutely adore this top! I receive so many compliments on it and the structured ruffle detail sits nicely on the chest. The tunic is comfortable and stylish - perfect wardrobe staple to wear through fall and winter for festive drinks, a dinner date, or even to work! I cannot recommend Devon Baer products enough! This can be paired with a black skirt, slacks, or jeans. Dress up or down. Fabric good quality, flattering fit. Very pleased overall. this top is gorgeous. i love how lightweight the material is. its super flattering and a perfect on-trend piece to wear during the holiday season. looks great untucked with dress pants, or tucked into jeans/skirts. I LOVE! Beautiful fabric. 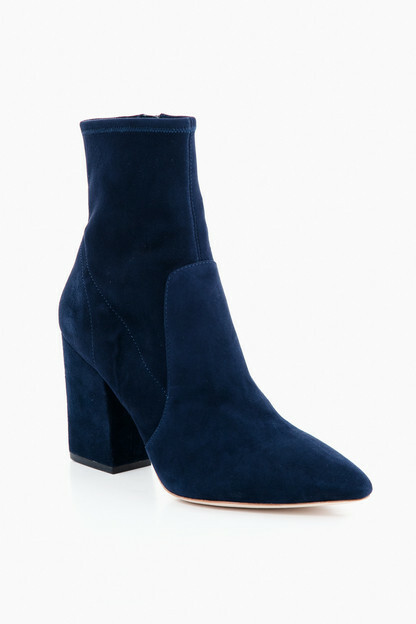 I styled mine with skinny velvet black pants and black heels for a casual holiday event, but the color scheme isn’t too themed so you could easily wear all season. True to size. It’s shaped, but not too close. I am very pleased. I love my beautiful Blackwatch Tunic! I can wear it with jeans or dress it up with velvet pants! It fits perfectly and the quality is spot on! I will be wearing it a lot! The perfect holiday top! I loved it last year,but it sold out before I could get one. I sized up from my normal size only because it was tight in my chest . Love it! Beautiful material and fit! There is no doubt this will be a wardrobe staple for years to come! The ruffle adds that extra feminine touch. I simply adore this blouse!! Perfect blouse, dress up or down. Hits in all the right spots! I can't wait to wear this for holiday parties. It's the perfect item to dress up or dress down. 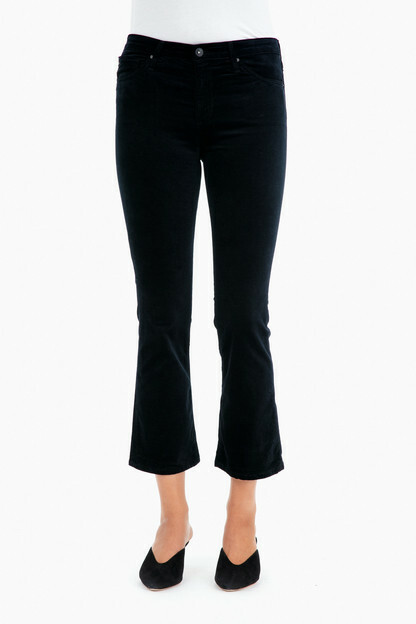 From black tuxedo pants to jeans - it works with anything! The fabric is surprisingly light, yet structured. I was afraid it would be too bulky for tucking in or layering, but it's not bulky at all. Substantial but lightweight. I just hope not everyone is wearing it to the same parties! Devon Baer is always classic and chic. The silk is lovely and the tartan is appropriate for Christmas through to St. Patrick's Day. This shirt is everything for the Holiday Season! Pair it with leggings, pants or a skirt. In fact wear it enough to pair it with all those! 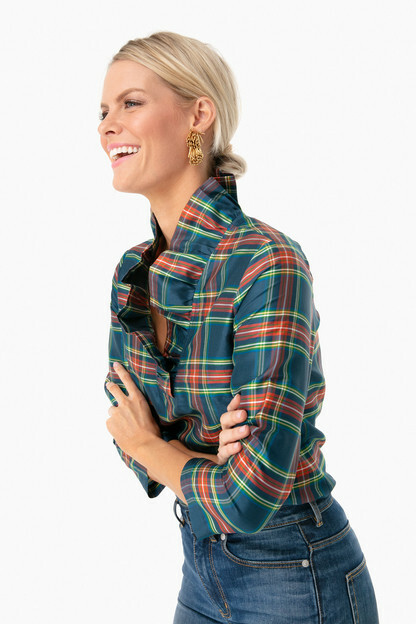 Holiday 2018 is mad for plaid and this shirt will be in my party and work rotation over and over and over again because it easily moves from office to party. My new favorite holiday top!!! I was on the hunt for the perfect blouse to wear for my 70th birthday party! I fell in love with this at first sight! The material and design are most elegant!! A very special blouse to mark a very special occasion! I love everything about this top. It is flattering and looks classic and elegant. I have worn this to work, a dinner party, and the list goes on. I ordered my normal size and it fits perfectly. Beautiful fabric and fit! Ruffle is very flattering, just the right size. So glad the Devon Baer tops are back this year! Perfect for the holiday season. Can't go wrong with plaid and ruffles! So glad Devon Baer tops are back! Classic, holiday season staple. Sophisticated yet easy. The material has no stretch so plan accordingly. I bought the large as I work out and often have issues with shirts with tight arms. I usually wear a 6/8. It’s large on me but not to big, the medium could have been to tight. I was hoping this blouse would go on sale, and when it did, I knew I had to buy it! I absolutely love ruffles on just about everything, especially on a collared shirt! I love the plaid too! I’ve never really seen a plaid shirt with a big ruffle along the collar like this one ,so I’d say this is quite unique. 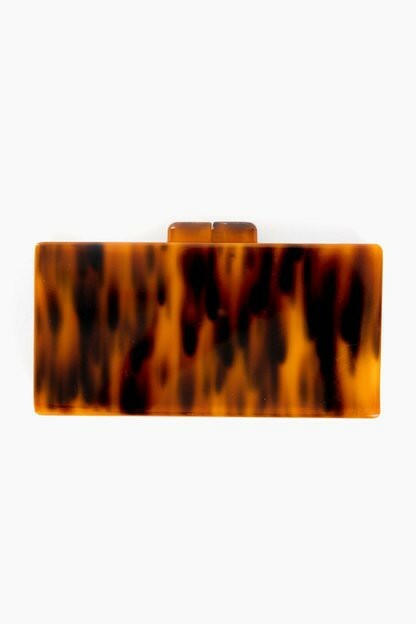 You will definitely stand out when you wear this! Very classy!!!! The top has a trendy, elegant, and sophisticated look. The lightweight fabric ticks in easily. The ruffled-neck hides many flaws and wrinkles on the neck. The high color gives it a dramatic look. Wearing an updo makes the color standout. I love everything about this top. I’m 5’1” and 145 pounds. The medium fits beautifully. This is simply stunning. However, the fabric has no give and it runs small, The team at Tuckernuck were kind enough to exchange it for me and I can't wait for the new size. It's really quite a must-have piece. This beautiful Plaid silk ruffle tunic top is a go to top for any occasion. You can dress it up paired with a sleek skirt for your dinner party . Its also great with a pair of jeans bouncing around doing errands. A must have . Love It!! Love this shirt! It can be dressed up or worn with jeans to mak it more of a casual look. I had many compliments when I wore it. Love the neck line and it was true to size. I’ve worn it twice already - once with black pants for my husband’s holiday party at his law firm and another time with vintage or to drinks with my friends. Love the fit, collar and color! I have received so many compliments on this shirt already, and I’ve only had it one week! Love the design but the fabric was much thinner than expected. Not what I was expecting for a winter tunic, so returned. If in between sizes, size down to get the fit on the model. Pulling through for Spring 2019! I grabbed this top in November to style with the red Amaryllis earrings and boots for a fun holiday party look but plan on wearing it with my white jeans for spring! The colors are so pretty together that I can’t back it away just yet! One of my favorite purchases to date! This is the perfect shirt to dress up or down for the fall/winter. I love the ruffle, gorgeous plaid, and the material falls just right. For reference, I’m 5’4, 118 and the XS fit perfectly. The tunic was a bit fuller in color than shown and just wasn’t as cute as I had hoped for the price. This is the perfect fitting top! I bought this to wear to holiday parties and now want to find more reasons to wear it. I’ve received countless compliments on it. I am 5’7 and 135 lbs and the M is perfect for me. Love this shirt but runs a tad bit small. Feels tight in the shoulders. Go up a size for a more tailored, comfortable fit. This tunic is even better than the picture shows. I am usually a size 10 and often wear a medium or a large depending on the fit. I do not like anything tight at all. I ordered a large and it is perfect. I plan to wear this with black narrow leg pants for the holidays. The top is not overly heavy and not stiff. Super flattering neckline. I am plaid obsessed and this shirt makes me so happy to see in my closet -- pairs with jeans and flats for a more casual look but looks so cute with black pants and heels for a dressier occasion. Such a festive shirt -- can't wait to wear for turkey day! This top is so fun for the holidays - I love it tucked in with high waisted pants or loose with pixie pants. The raw silk fabric is so beautiful too, I get compliments every time I wear it. I wear a 0/X-Small in tops and opted for the XS, and it fits perfectly! Got this top early last winter. LOVE it! It's simple and easy to dress up or down with black pants or jeans. Great fit! Flattering and festive.